Over the last decade, Cristiano Ronaldo has scored plenty of goals and he has done it in many different ways. One of his main strengths is beyond any doubts his free-kicks, which he has perfected to the limit since he arrived to England and Manchester United in 2003. Cristiano Ronaldo has many impressive aspects to his game and that's why he is arguably the best player in the World right now. The Real Madrid ace has power, pace, trickery and can even head the ball with supreme skill. It's that all-round ability that makes many people out there believe that he is indeed better than all of his contemporaries in the game. But perhaps the player's best and most memorable contributions on the football field have come from dead ball situations. 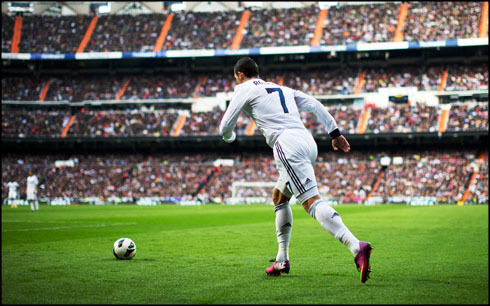 Ronaldo's ability to strike a free kick and hit the back of the net before the keeper has even moved, make him a favourite not only for Real Madrid fans but for neutral football supporters across the globe. Despite losing out on the title to city rivals Atletico Madrid last year, Real are favourites at 1.94 with Betfair to win La Liga in 2014-15 and Carlo Ancelotti's side will need their star player to be at his deadliest from this kind of set piece. In the context of the game itself, this isn't the most important goal that CR7 has ever scored, but many will argue that it was his best ever free kick. While on their way to yet another English Premier League title, struggling Portsmouth visited Old Trafford on 30th January 2008 and were 1-0 down when Manchester United were given a free kick in a central position some 30 yards from goal. English supporters were well aware that United's number 7 was a threat from set pieces, but nobody was prepared for the drama that followed. Ronaldo lined the ball up but entered a long discussion with Wayne Rooney and at that point, it was debatable as to which of them would take it. Fortunately for the footballing world as a whole, Cristiano took responsibility and fired into the top right hand corner of the Portsmouth net with speed and swerve that was incredible to watch. The reaction of the players summed things up: Pompey keeper David James just shook his head while United's men, including Ronaldo, just smiled as if they knew they had all been a part of something very special. Like all players, Cristiano Ronaldo needed a little settling in time at his new club, but if Real fans were still unconvinced by the huge transfer fee paid to Manchester United, they would surely know they had signed a superstar after this wonderful free kick. The notable thing about this effort was the distance involved and although the placement was fairly central, the Portuguese international had some 40 yards in which to deceive and beat Steve Mandada in the Marseille goal. It was an incredible effort with pace and dip that gave the keeper no chance in a game which Real Madrid went on to win by three goals to nil. Two of those strikes came from Ronaldo but this is the one that we all remember. By this stage, goalkeepers all over the world were dreading the sight of Cristiano Ronaldo winning a free kick. The careful placement followed by the wide legged stance could only spell trouble and so it proved in this Spanish League tie against Villarreal. The goal may be no better than the others on this list, but the footage is good because it lines up almost directly behind the player as we see the ball threaten to swerve to the left before taking a wide swing in the opposite direction and giving the keeper no chance. Of all the free kicks on this list, this is by far the most important in terms of the game and the result as the winners would progress to the Champions League final of 2009. Manchester United won the first leg by the narrowest of 1-0 margins and needed a positive scoreline in the return. After taking an early lead, Ronaldo simply smashed in this beauty from around 40 yards. There's little swerve in this – just pure power as the ball is driven at high speed to beat Arsenal keeper Manuel Almunia on his near post. An 8-2 aggregate win over Apoel in the UEFA Champions League group stages of 2012 suggests that this wasn't the most vital free kick that Ronaldo has ever scored, but it was certainly one of the most special. Here, the forward has the tightest of angles and a very small target as he beats the wall and creates amazing dip in the final stages of the ball's flight. It's an incredible goal and once again, CR7 has made it all look so easy! Cristiano Ronaldo next game for Real Madrid will be against Fiorentina, in another pre-season fixture to prepare the upcoming challenges and it's scheduled for August 16. You can watch Juventus live stream, Real Madrid vs Fiorentina live, Barcelona vs León, Manchester United vs Swansea City, and Arsenal vs Crystal Palace, all matches provided from our soccer live football pages.